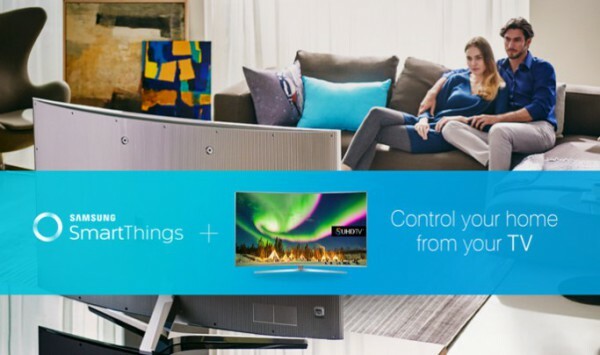 The Internet of Things is the hot buzz-phrase right now and Samsung has an iron in the fire with SmartThings. Its line of products is also compatible with those made by other manufacturers -- that's the biggest catch with all of this, as not everything is compatible with all competing products. Now Samsung is bringing its SmartThings platform to its own line of TVs and all 2016 models will offer built-in compatibility. This allows for control of your home right from the screen in your living room, or wherever you may have the product. The first of these TVs will be on display at this year's Consumer Electronics Show which kicks off in early January. These are devices that will be available this coming year. It does take a minor amount of work on the part of the consumer -- you'll need to plug in a dongle, but then you'll have access to a range of products across platforms such as Zigbee and Z-Wave. "The SmartThings SUHD application will allow you to trigger different SmartThings Routines, get notifications when important events happen, see what’s happening in and around your home with compatible cameras, and control your connected devices–all from the TV", the company states. Also being unwrapped for the new year is a security system for smart TVs that Samsung has dubbed GAIA. The company hopes that this will provide a measure of protection across services, software and hardware. "Protecting consumers' personal information is of the utmost importance to Samsung, both in terms of the company’s values and what’s needed for the continued growth and success of the IoT ecosystem", says Hyun Suk Kim, President of Visual Display Business at Samsung Electronics. "GAIA is a security solution that will give Samsung customers security and peace of mind now and in the future". Both the TVs and the new security system for them will be available in 2016.